Don’t chia wish your breakfast was as delicious as mine? 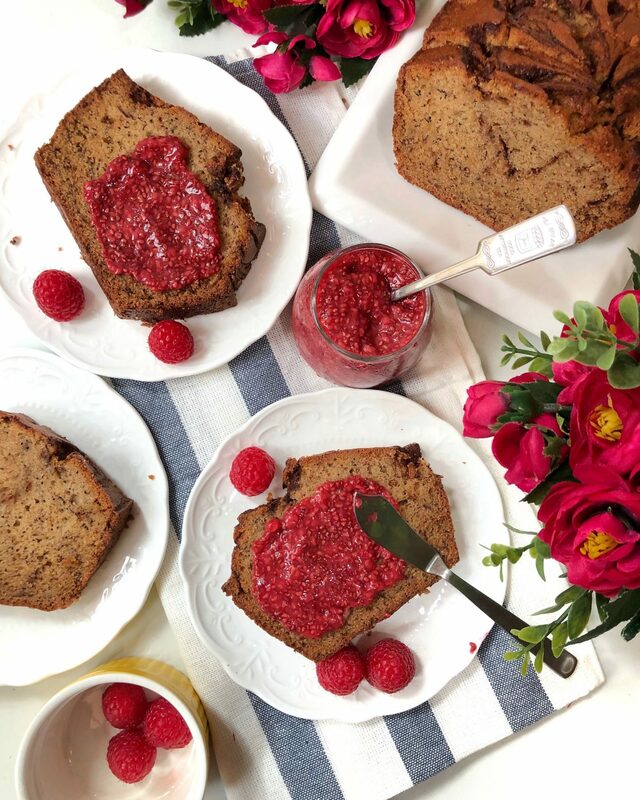 Until today, I’m still craving for these Raspberry Chia Jam I made a couple of days ago. It was beyond delicious that I tried experimenting with different kinds of fruits such as Cherries, Blueberries and Strawberries. This recipe was inspired by my dearest friend Deepika who blogs at TheLoveOfCakes. 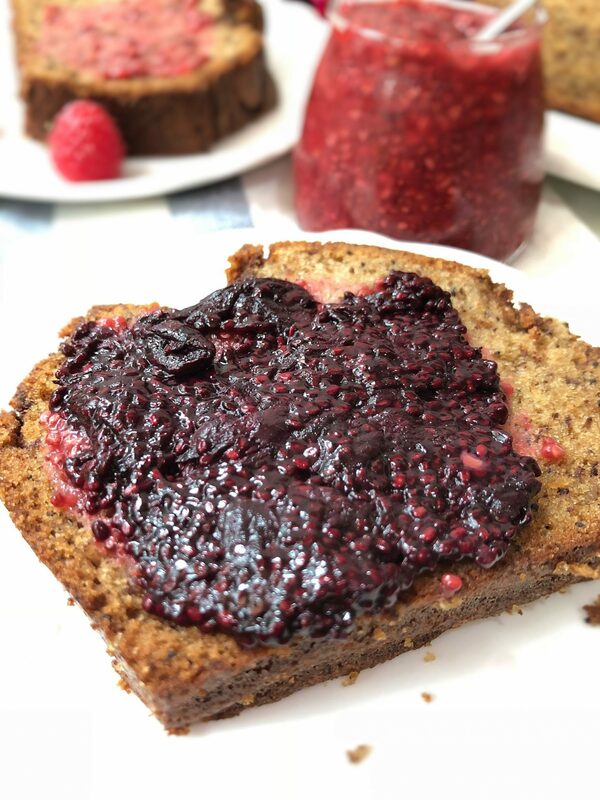 When I first saw her post on Cherry Chia Jam, I bookmarked it immediately and not long after, I finally got down to making it. Do check out her website for more delicious recipes! She’s a true gem in the kitchen and I’m so glad we got to know each other better through much food talk and of course our common love for desserts and Nutella! Don’t you just love foodie friends!! 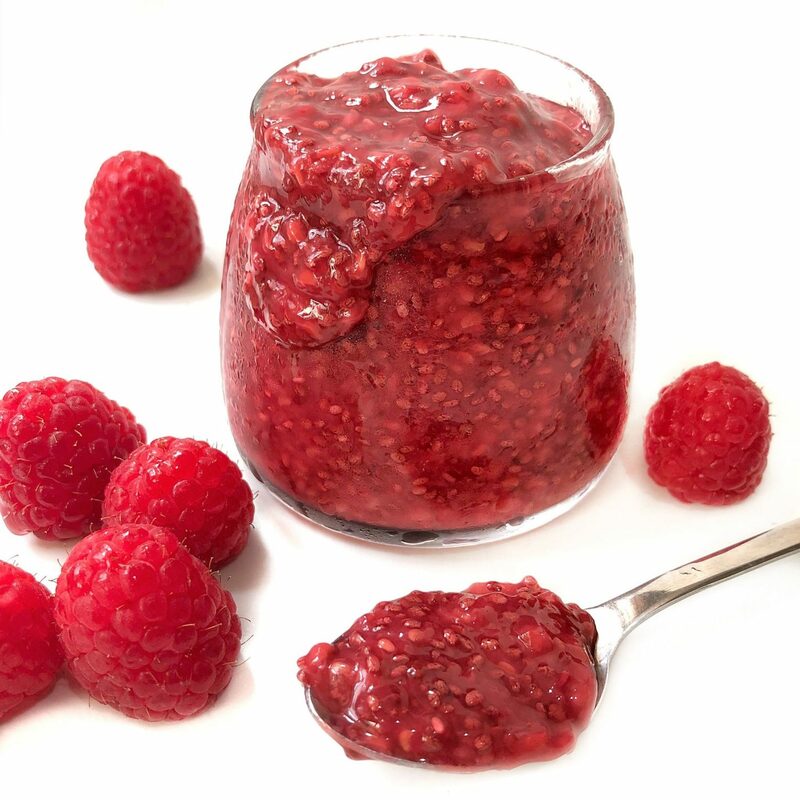 For this recipe, I used Raspberries instead of Cherries because I love my jam sourish. Added a little honey to sweeten it up. But 2 days later, I tried the jam again without any honey and it was still delicious! My 18 month year old nephew kept asking for more! If you are looking to cut back your sugar intake, you can always omit the sweetener. I have a couple of other baby friendly food recipes if you’re interested. Sometimes I get bored with spreading the same type of jam on toast so the best way to solve this is to mix the fruits. You’ll get a lovely mixed berry chia jam which is equally yummy. I decided to mix some of the raspberry chia jam with blueberry chia jam. That yields a darker looking jam (Picture below). FANTASTIC! I should have made a bigger batch if I knew it was such a hot favourite in the house. The thing with making your own Chia Jams is that when you start making them, you’ll never go back to store-bought ones. At least for me, I know what goes in my jam and that excludes all the nasty excessive addition of preservatives or refined sugar. Don’t you just love No refined Sugar Desserts. Gotta admit it goes well on toast, oatmeal, yogurt, smoothies and even cake. 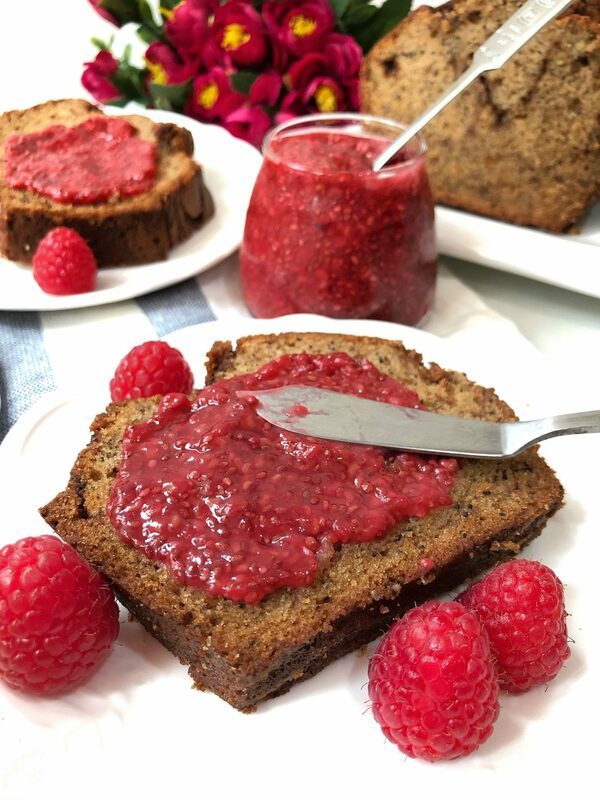 I couldn’t resist spreading some of this Raspberry Chia Jam on my Cinnamon Swirl banana bread (THE BEST Moist tasting banana bread–> Check out the recipe here ) . Smack my lips, we are all in for a treat! Do comment in the post below or tag me on Instagram: @sherbakes if you attempt your very own. Would love to share your joy in baking adventures. 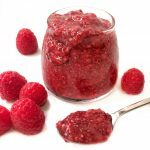 Place raspberries ( or fruits) into a medium saucepan and boil till soft.